This is a so-called traditional production of Meistersinger, recorded live in 2008 at the Vienna State Opera, which for obscure reasons decided to revive Schenk´s 1975 staging of Wagner´s Meistersinger under the label “new production”, referring to a socalled “musical reinterpretation” by German conductor Christian Thielemann. We already know Otto Schenk´s Meistersinger from the DVD from the Metropolitan Opera. This Vienna production is not quite as sumptuous, in fact it is rather austere and dusty at times, especially in the first act. I remember well that in 2008 Thielemann was unanimously praised by the Austrian press for these performances, labelling them the best conducted Meistersinger in Vienna in decades and five hours of pure pleasure – referring mainly to the orchestral performance. I am well acquainted with Thielemann´s mighty way with this score: Light, yet not too light, and with this inherent understanding of Wagnerian phrases, including in Thielemann´s case some very unconventional phrasing slowing the orchestra down at decisive points. Such as the much-debated major pause he always takes between “wach” and “auf” in the 3rd Act, It is still there. Egocentric or courageous? Probably both. That Christian Thielemann favours traditional productions is no secret and not a problem as such. A traditional production may be as good, or better than a modern. That entirely depends on the individual characterization by the singers. However, too often, traditional sets are combined with a lack of personal direction + a not negligible amount of dust. Which is the case here. It is understandable that Thielemann likes Johan Botha´s voice as it is both glorious and solid. But.. this is not a CD, and excuse me, the man is simply too heavy and cannot act his way out of a paper bag. But Ricarda Merberth? Really she is quite disappointing as Eva: Matronly, wobbly and unexquisite, she is the stand-up-and-deliver type of singer. One shouldn´t think Eva would be that hard a part to cast? She looks rather like the superb Ain Angers mother than his daughter. And with Michaela Selingers feisty Magdalena looking ten years younger and feistier than Eva. Michael Schade as well makes a rather mature, but however well sung David. Falk Struckmann´s rather metallic voice with a certain lack of warmth may not be to everyones liking, however he is in better shape here than otherwise around that time. Best is Adrian Eröd as Beckmesser: Funny as well as well sung and the scenes between Beckmesser and Sachs remain among the few infusing some life into this otherwise rather un-dead production. However, we already know Otto Schens Meistersinger from the Metropolitan Opera released on DVD, with a vastly superior cast. Christian Thielemann´s Meistersinger is worth preserving Otto Schenk´s Vienna State Opera production with the current cast really is not. This is the third Meistersinger I have reviewed here at Classical Net. The other two were the Barenboim on EuroArts, from 1999, with Robert Holl as Hans Sachs, and the Rafael Frühbeck de Burgos on Arthaus, from 1995, with Wolfgang Brendel in the lead. I also reviewed the second Solti, on Decca, for another concern. The Solti was a CD set, but the others were DVD issues. Who wins? Well, first they were all pretty good, but Solti probably had the edge, not least because he had Ben Heppner as Walther, José van Dam as Sachs and Karita Mattila as Eva. But then if you”re looking for a DVD of this opera, Solti of course won’t do. This Medici Arts offering is quite good and features strong singing from all the principals. I especially liked Michael Schade as David, and Johan Botha’s Walther was also brilliant. His Morgenlich leuchtend in rosigem Schein was nicely sung, and throughout the opera he turned in fine work. But the real star was Falk Struckmann as Hans Sachs. How can this opera really succeed without a strong singer in that role? Struckmann delivered charisma, and, come to think of it, so did Adrian Eröd as Beckmesser, a most colorful villain here. Christian Thielemann leads the proceedings with a knowing baton, imparting spirit and color to the playing and choral parts. The only thing I found slightly bothersome was Thielemann’s somewhat exaggerated dynamics. In the overture, to cite the most obvious example, he leads the main theme with less a sense of majesty than is customary: after the four emphatic chords at the outset of this glorious theme, he drops the dynamics down quite low, but then with the ascending notes that follow, gradually brings back greater heft. In this respect, he conducts the theme unlike anyone else I’ve heard before. But I suppose this is a minor quibble, because he really does conduct with true Wagnerian spirit. In the end, he must be credited with a fine interpretation of this Wagner masterpiece. That said, I’d give Barenboim the edge. Still, because the production values (staging, sets, lighting, costumes, etc.) are high and the sound reproduction and camera work are fine, this Medici Arts Meistersinger must be counted as a worthwhile entry among current DVDs of Die Meistersinger. Recorded live at the Vienna State Opera – 1/19 & 1/23, 2008. Based on a stage production by Otto Schenk. Recommended. This is perhaps the finest recording, either on DVD or CD, of Wagner’s complex masterpiece, of which it seems any production is inevitably flawed. What is remarkable about this one is that the conducting of Christian Thielemann is so idiomatic and penetrating, if one overlooks a few passages where he lapses into mannerism – he loves super-extended pauses – or becomes briefly turgid. He keeps the whole piece, very close to five hours, moving irresistibly, and he has the Vienna Philharmonic playing magnificently, untiringly, and a superb cast. With so many important roles in Meistersinger, recordings are usually let down by the singer of at least one of the major roles. 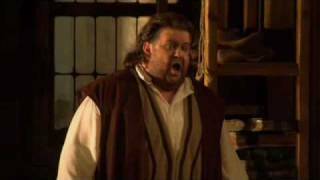 This one has the noblest contemporary Sachs, Falk Struckmann, in top form, and Johan Botha, a man-mountain, as an exceptionally sensitive Walther, and an expressive actor despite his bulk. The Pogner of Ain Auger is phenomenally fine, and Adrian Eröd’s Beckmesser is outstanding. In Act I, where Wagner sets a committee meeting to sublime music, the individual characterisations, many of them very small roles, are all memorable. Otto Schenk’s production is as traditional as can be, but is full of vitality, and without a trace of routine. Sticking mainly very closely to Wagner’s stage directions – a revolutionary stroke – and well photographed, it illuminates point after point in the action. However, and inevitably, there is one moderately severe reservation: Eva, the heroine of the work, round whom the plot revolves, is played by Ricarda Merbeth, who has a fairly pleasing voice, though hardly of the level of the rest of the cast. Worse, she pulls the most horrifying faces when she sings any high or loud note – I had to look away. If you can cope with that, this is the recording of the work to get, in any format.